Side entrance tent: A dressing room... a place for the dog to sleep... or a place for a port-a-potty. Our custom built side tent is silver with black accents. 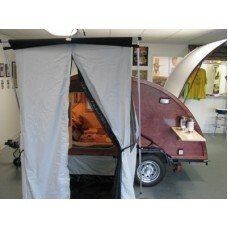 Side tent has screened windows with privacy curtains on both sides, and a screened door for maxi..